Oh dear, I seem to have lost another week?!. It seems to happen to me a lot in the colder months, I'm inside busy crafting and sewing instead of gardening. 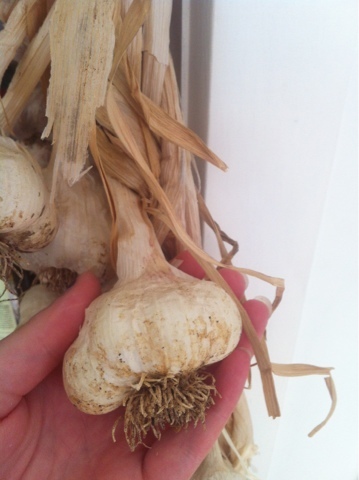 I thought I would spotlight a garlic variety since its that time of the year in the Southern Hemisphere, last year I grew 4 varieties of garlic and 'Cream' from the Diggers Club was the clear winner - huge bulbs with easy to peel cloves and great flavour. This is some of my 'Cream' harvest from last year. 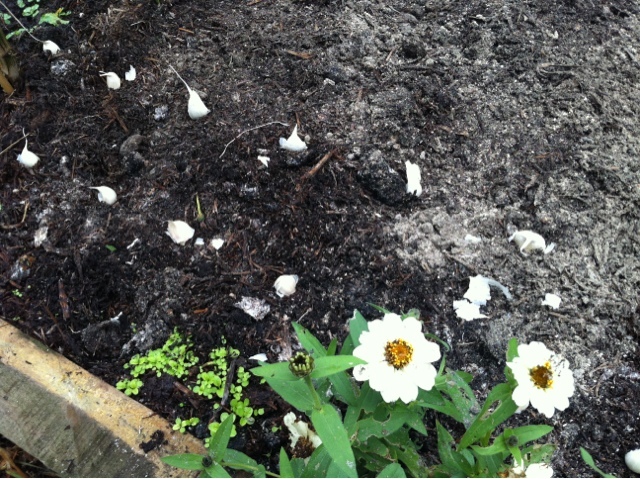 I planted them last Sunday, I was trying out planing garlic by the moon. I also planted 2 varieties in late march to see which planting date produces the best yield. 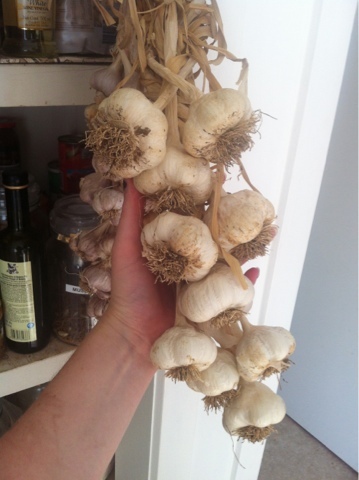 I picked two of my biggest looking bulbs and put them in the fridge for a few weeks to encourage sprouting. 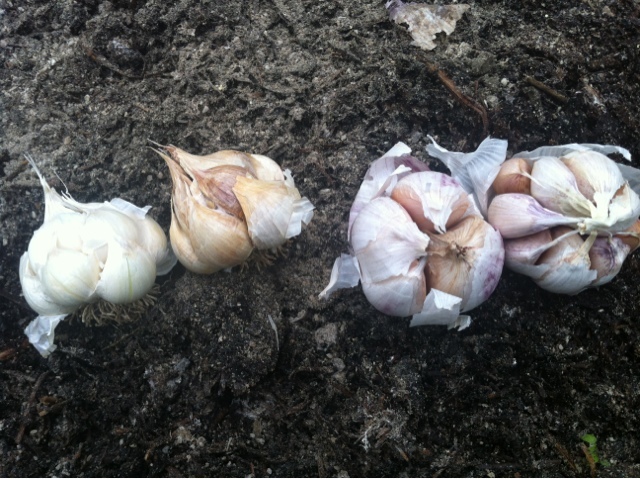 The top two are the 'Cream' variety and the bottom two a Manaro Purple. 'Cream' is a soft neck variety, these seem to grow better in my garden as we don't get frosts or temps below 5 degrees (generally) as we are surrounded by water and bays which regulate our temperature, but for "research"(if you can call it that) I have planted 2 hard neck varieties as well. I actually for rid of the bulb on the right as I didn't like the colour and picked another large clove from my garlic plait. 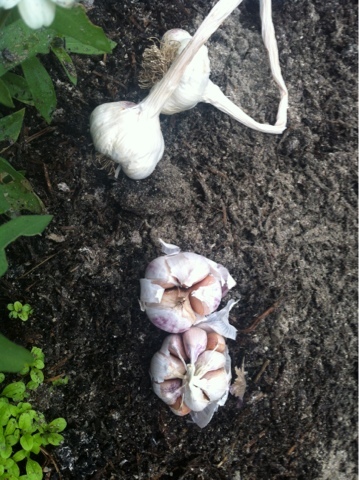 I like to plant garlic in a 10cmx10cm grid pattern (you can see some wood ash from a bonfire we had recently, I sprinkled it over all my garden beds) and then cover with mulch and wait, its that easy - last year these were ready late October. I'm glad I had some saved as when I logged onto the Diggers website to pick a few more varieties they were sold out - maybe everyone else had a great success with them last year too. Thanks to Liz from Suburban Tomato for hosting this great informative series.